I have prepared this semiya pongal recipe two years back for pongal and totally i for got about this recipe. Last year i have posted many recipes for pongal and this year i am in little lag. So two days back i was turning my old recipe diary pages and i found this yummy recipe tried by me earlier. I prepared that recipe once again and now i am super excited to share this recipe for this year pongal. 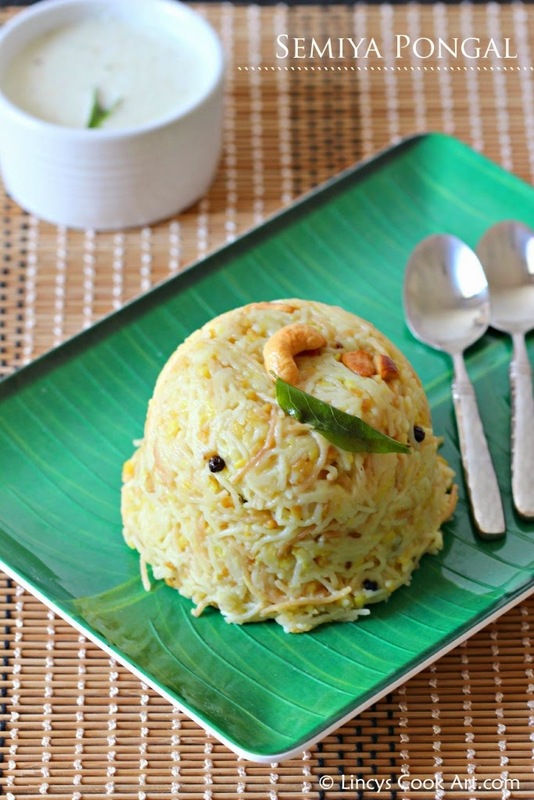 This is a must try pongal recipe i have to say. Because it tastes great and it requires very less ghee for this pongal. We like this version of pongal a lot. Do try this recipe at your home for this pongal and let me know the feed back. Dry roast the vermicelli in a pan till light golen colour and set aside. Roast the moong dhal till light golden colour. Wash the dhal if necessary. Add 1½ cups of water, a pinch of turmeric powder and ginger; close with the lid and pressure cook on low flame for 3 whistles. Meanwhile heat ghee in a pan and fry the cashewnuts and set aside. In the same ghee fry the pepper, jeera and curry leaves; set aside. Once the steam goes off add a cup of water more and enough salt. Bring it to boil, once it starts to become rolling hot add the roasted vermicelli half a cup at a time and mix well. Like wise add the whole lot and mix well. Slightly close with a lid and allow to cook normally in low flame. Open the lid and mix once or twice to prevent the pongal catching at the bottom. Once the vermicelli is almost cooked pour the pepper, jeera and curry leaves with the ghee and cook for a minute to mix all the flavours. Add the fried cashew nuts too and mix well. Notes: Add extra ghee for melt in mouth taste. You could add little milk before adding the vermicelli if you like. love this semiya pongal to core!! !